Use this tool to combine your layers into one terrain and paint quicker landscape in Tiled editor. Each tileset should contain every possible tile combination. Use below template to create your own. Only 15 tiles are used, the last one is ignored. I’ve tested this tool for generating terrain of 2, 3 and 4 tilesets. Adding more would probably cause longer generation time, and also I’m not sure how would Tiled react to that. Open the generator and set your tile size. Default is 16px x 16px. 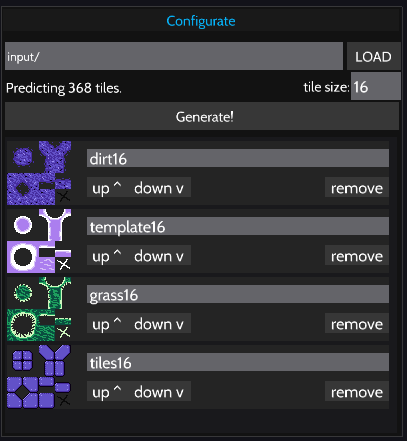 Change it in “Configurate” window if you’re using different tile size. Width and height must be equal, eg. 32px x 32px. Put all your tilesets into input folder (next to the program executable), type your filename in generator (with an extension!) and hit LOAD. Your tileset should appear in the list below. The terrain will be available to preview in the right part of window. Now you can move both files from Auto Terrain Generator folder to your own game. To use your new terrain you have to open new map in Tiled, go to menu and hit “Map” -> “Add external tileset”. Navigate to generator’s output/ folder and choose output.tsx file. luxe engine – luxe is a free, open source cross platform rapid development haxe based game engine for deploying games on Mac, Windows, Linux, Android, iOS and WebGL. mint – mint is minimal, renderer agnostic ui library for Haxe. format – The format library contains support for different file-formats for the Haxe programming language.